Some of you might think, why do we need another yoga mat on the market? Aren’t there already enough mats on the planet? How can it be sustainable to produce another product when there are already existing so many kinds? The answer to all these questions is the closed loop approach of hejhej-mats. A hejhej-mats yoga mat is made out of recycled materials which mean that for the production of hejhej-mats almost no new resources are taken from the planet. Furthermore, the hejhej-mats are recyclable at the end of their lifetime so all their components can flow into new production again. Consequential, hejhej-mats will not produce any new waste for the planet. Most existing yoga mats do not get recycled. Did you know that most of the existing yoga mats do not get recycled but are also not biodegradable? It means they will stay on the planet forever. Seeking to achieve a sustainable planet that allows future generations to live a lifestyle similar to ours right now, we need to eliminate the concept of waste and rethink waste as a resource. The current linear “take-make-dispose” approach is reaching the physical limits of the planet. Visual effects of this are among many others the diminishing rainforests and the rising amount of waste that gets dumped into the ocean each year. This "take-make-dispose" approach is also known as the linear economy, where products are designed for a single use purpose and afterward get thrown away. A slightly better approach is the recycling economy, where products can be recycled and therefore the components can be used again and do not end up as waste straight away. However, in the recycling process products often get down-cycled - into something with lesser quality than the original state of the product. Another downside of the recycling economy is that nutrients can not flow endlessly in production cycles. The solution to all these problems lies within the circular economy. A closed-loop economy is all about rethinking current production patterns to achieve a restorative economy that works in consonance with environmental interests. In closed-loop productions, every output is either returned harmlessly to the ecosystem as a nutrient or becomes input for another manufacturing process. 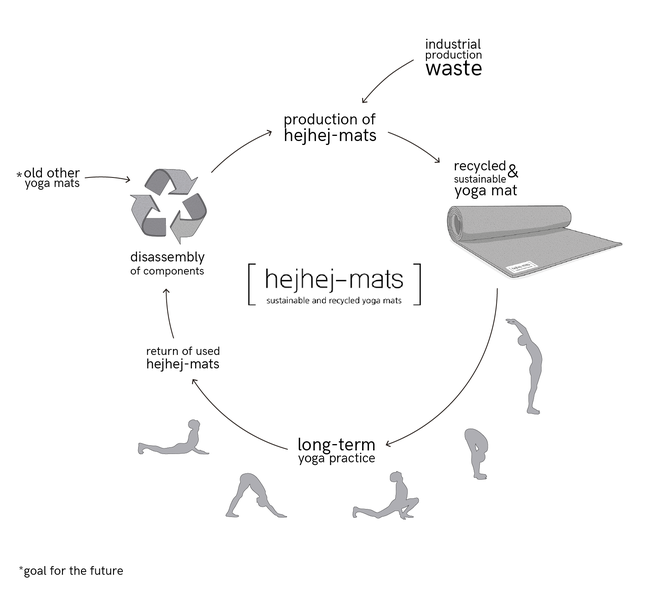 hejhej-mats makes use of the second approach, as the components of the closed-loop yoga mat will flow into new production once the mat has reached the end of its lifespan. Practicing yoga on a closed-loop yoga mat is not only good for you, but also good for the planet. In our graphic above you can see how the circular approach works in the case of hejhej-mats. For the production of our yoga mats, we use waste that arises in many industries in the form of offcuts. By producing our yoga mats out of these offcuts, we are able to give this type of waste a new life. Our closed-loop yoga mats are designed to have a long life and to support you for a long time during your yoga practice, however, eventually they will reach the end of their life span. Reaching this point does not mean the end - it means the start of something new. We will take your used hejhej-mats back and disassemble it to use all of its components for the production of new yoga mats. Our goal for the future is, to also collect any other used yoga mat and make use of its nutrients as a resource for our products as well. However, this is quite tricky and therefore takes us more intense research and development time. Our beautiful graphic explains you our business model and shows you our closed-loop approach, feel free to share it with your friends and join our journey towards a circular future. For more info about the circular economy check out Plan C or the Ellen Mc Arthur Foundation. The hejhej-mats circle was drawn by the talented Grace Uribe.